Can it happen that the Turkish Stream pipeline will be implemented only by half? Why? In December last year, Russian President Vladimir Putin and his Turkish counterpart Recep Tayyip Erdogan agreed to build a gas pipeline, known as "Turkish Stream". As is well known, this pipeline should be built in place of the canceled “South Stream” under the Black Sea through Turkey to the border with Greece. Turkey enthusiastically embraced the initiative of Russia. “Turkey and Europe will be taking as much gas as they need, this means Turkey will serve an energy hub for the entire region”, President Erdogan said at an oil and gas sector workshop in December in Ankara. After ten months, it becomes clear that there is the frustration of many regarding the negotiation process, as it has gone on for too long. In all that time passed since the official launch of the project “Turkish stream”, the parties have not yet signed an Intergovernmental Agreement (IGA) to formalize what was agreed at the highest level in December. It has already given rise to a wide speculation for mass media and expert community about the prospects of the project implementation and even its inexpedience for Turkey. Yet logic suggests that the remarks stating that the project is not even profitable for Turkey clearly look false. Obviously, Turkey will be able to obtain from the “Turkish Stream” both economic and political benefits. Apart from meeting the growing demand for gas in the Turkish domestic market, the economic attractiveness of the project is ensured by possibility of obtaining annual payments for gas transit services to the border with Greece. “Turkish Stream” onshore section is 180 km. With a total capacity of gas supplies of 47 bcm, transit payments received by Turkey will amount to about 250 million USD per year. Along with such revenues, there are political benefits that entails the growth of Turkish influence in both the Balkans and the EU although it is difficult to quantify them. Of course, multi-billion-euro international projects are not organized "overnight," and haste would not be productive at all, if it is necessary to achieve an acceptable balance between the interests of both parties. However, there is another kind of balance in the basics of business philosophy which is characterized by the expression "time is money", attributed to Benjamin Franklin. It is considered an axiom that the loss of time is equivalent to the loss of money. In other words the attempts to mark time in order to induce more benefits to their advantage, increasing the risk of losing at least part of their interests and capabilities. Following this logic in relation to the project "Turkish stream," it can be assumed that 2015, especially its first half, in the future will also be called as the time of missed opportunities when the process of decision-making and bilateral agreements on the project has been suspended. As a result, if you are keeping track of developments, you know that in September Gazprom officially announced about the postponement of the "Turkish stream" launch, as it is not feasible to put into operation the first string in December 2016, as originally planned. The political crisis in Turkey, where after the elections in June, the ruling party failed to form a new government, is used as a reason of the delay. Under the circumstances, the signing of the IGA will be possible only after the early parliamentary elections in November and the subsequent formation of a new government in Ankara. Nevertheless, this is not the only reason for the postponement of construction plans, since the IGA could have been inked earlier in the first half of the year before the beginning of the political crisis. 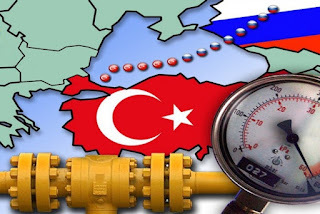 Other reasons are caused by the desire of Turkey to use its position in negotiations with Russia, because, as it seemed, Russia had no other alternatives to developing a new route of gas supplies to Europe in replacement of the canceled “South Stream”. Upon the statements of high-ranking officials in Ankara, Turkey continues to insist on granting with no delay a discount over prices of Russian gas. Initially this discount was part of last year's agreement between Moscow and Ankara over the construction of the “Turkish Stream”. President Putin, during his visit to Turkey on December 1, said that Russia is ready to give a discount of 6% for the supplied gas. In the course of further negotiations, the Turkish side held out for a higher discount, supposing that it should be not less than 10.25%. According to Reuters, the talks between Ankara and Moscow on the construction of the "Turkish Stream" were suspended in late July due to the lack of a key agreement on a discount. Looking back, most likely, if the IGA had been signed before the political crisis, then the discount would also have been approved. Besides that, Turkish Minister of Energy Taner Yildiz said that Turkey would like to sell itself gas from the Turkish stream. It means that Turkey wants to buy Russian gas at its border and then to carry out its own sales to the EU. A similar story had already taken place in Ukraine, where Kyiv twice in 2009 and in 2014 declared its desire to buy gas at the border with Russia and sell it on their own to Europe. Russia did not accepted the Ukrainian initiative. There were no enough supporters of the Ukrainian initiative in the EU either, because obviously it is contrary to the European principles of gas trade, aimed at restricting the activities of intermediaries and resellers. No doubt reselling of gas by Turkey for supplies to Europe would lead to an increase in prices and pose an additional financial burden on our European consumers. So it is unlikely acceptable and it seems to be widely understood in Turkey, especially, in light of Turkish declarations to enter the European Union and to join the European energy legislation. Alongside with the reasons for changes in the construction schedule of the “Turkish stream”, it is interesting to be aware of its implications. Turkey's attempts to squeeze more preferences in exchange for further promotion of the "Turkish Stream" project and an indefinite prolongation of talks has led to the fact that Turkey's plans to become one of major transit countries for gas supplies to Europe now are losing a solid ground. Russia has reacted to such walking of Turkish partners at a tardy pace by means of a new step in collaboration with partners in Europe. Early in September, the Russian gas group Gazprom signed a shareholders' agreement with BASF/Wintershall, E.ON, Engie, OMV and Shell to build “Nord Stream 2” pipeline system to increase gas supplies to the EU. The new project company “New European Pipeline AG” for the construction of the “Nord Stream 2” has already been registered in Switzerland with a share capital of 1 million CHF. The “Nord Stream 2” project envisages the construction of two offshore pipelines with the aggregate annual capacity of 55 bcm of gas to be installed from Russia to Germany through the Baltic Sea and its implementation has been targeted by the end of 2019. Now, let us recall that under Gazprom's plans, the “Turkish Stream” pipeline will be split into four offshore pipeline strings with a total capacity of 63 bcm a year. The laying of the first string was planned to start in mid-summer this year, and complete the construction of all four strings by the end of 2019. At the same time with public announcements regarding the project "North Stream 2", there were reports that "Turkish Stream" can be reduced up to two strings. Meanwhile Moscow sent two offers to Ankara relating to the “Turkish Stream” project, apparently showing readiness to untie a negotiations jam regarding the pipeline for gas deliveries to Turkey. Russia’s Energy Minister Alexander Novak said that Moscow is ready to sign an IGA for the construction of one string of “Turkish Stream” that will supply gas for the Turkish market only which is to take about 14 bcm. A separate IGA can be concluded for the construction of pipes 2 to 4, which are projected to carry gas to the EU via Turkish territory. Obviously, the final number of the offshore pipeline strings will depend on the readiness of Turkey as well as demand for gas in the Eastern European countries. It does not clarify how much the new initiative on the “Nord Stream 2” would affect this decision but anyway it occurs. The whole world witnessed how our European companies once again demonstrated their business acumen, and how Germany is seizing the initiative from Turkey to receive a new powerful stream of Russian gas and new opportunities for transit services. It is important that significant volumes of gas from the "North Stream 2" can be intended for consumers who expect to receive it through the "Turkish stream." This is especially refers to Italy, since the end point of the "North Stream 2" on the Baltic Sea coast near Greifswald is much closer to Baumgarten where the biggest import and transfer station for natural gas is located in Austria. The currently effective contracts with Italian companies stipulate Baumgarten as the natural gas transfer station. Naturally, a shorter route of gas supplies is more attractive because it allows reducing the transportation costs and favorably affects the utilities prices. Thus, if the "Turkish Stream" remains only with two instead of four strings of the pipeline, Turkey will have to say goodbye to the expectations of the large transit incomes, which in this case will accrue to Germany and Austria, as well as with a challenging opportunity of being one of major transit countries for gas supplies to the EU. It is said that a well-known, especially in business circles, proverb "strike while the iron is hot" perhaps came to Europe from the old eastern folklore. Maybe so, because, in fact, this common saying, which sounds as an abstract from an instruction for business, can be found online in Turkish language - «Demir tavında dövülür». Meanwhile, the question is still open: why this time is Turkey missing to take advantage of their native saying while Europe really makes that?